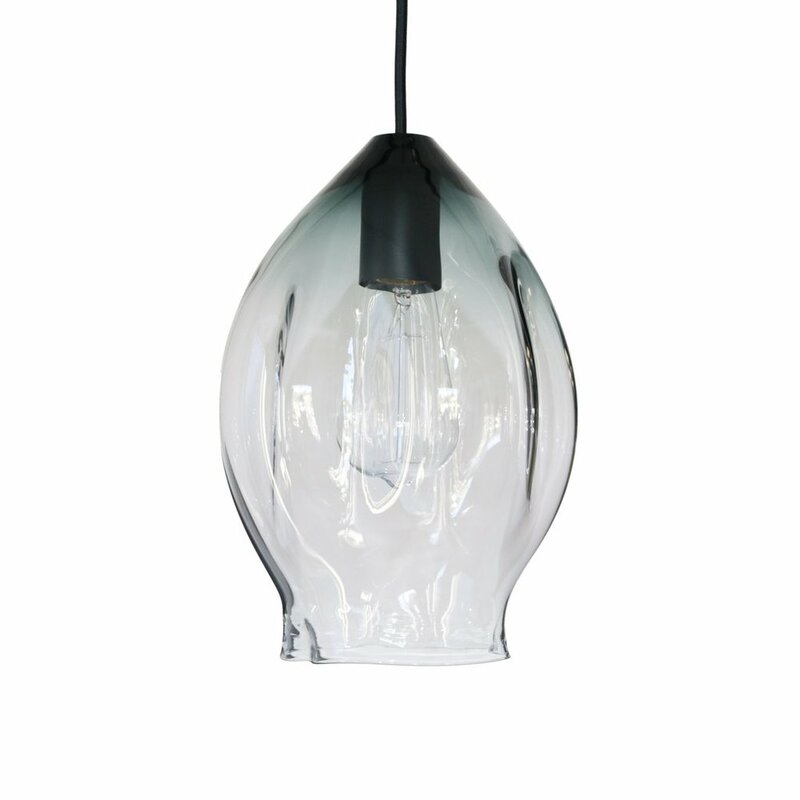 E. Esposito Interiors is the USA representative for SØKTAS of Australia a unique lighting manufacturer specializing in hand blown glass pendants, wall sconces, art and homeware. Contact E. Esposito Interiors for more details and how to purchase their stunning handmade pieces. Oliver Höglund and Ryan Roberts are the creative minds behind SØKTAS, and the company’s inception began in Oslo, Norway where they first met. Oliver focuses on creating and designing the unique pieces, while Ryan operates the business. SØKTAS is a reflection of both their stories and visions. Oliver’s father, Ola Höglund and grandfather, Erik Höglund worked at the renowned Kosta Boda Glassworks in Sweden, and the craft has been passed down through the generations. The skills and techniques learned by Oliver since 2001 have allowed him to develop his craft and create his own signature style. The process of hand-blowing glass is rigorous and intense, as the molten hot glass is shaped and blown by hand at around 1832° F by Oliver himself. Each piece made is different to the next, giving you a truly original piece of functional art. Made in Currumbin, Gold Coast of Australia. Before people learned to make glass, it was made by nature, in two ways. When lightning strikes sand, it sometimes fuses it into slender glass tubes called fulgurites. Volcanic eruptions also sometimes fuse rocks and sand into a glass called obsidian. Early people shaped obsidian into various objects, including adornments, weapons, and money. According to legend, man first made glass about 2000 BC. Phoenician sailors set up a camp on the sandy beach of a river in Syria and built a fireplace to support the cooking pots for their evening meal, using pieces of sodium carbonate found in their cargo from Egypt. The next morning they discovered that the sodium had fused with the sand and formed clumps of a clear substance – glass. In truth, it is not known exactly where or when people learned to make glass. It is believed that the first intentionally created glass was used as a glaze on ceramics earlier than 3000 B.C., but it wasn't until around 1500 B.C. that glass vessels began to appear in Egypt. The popularity of glass manufacturing rose and fell for hundreds of years until it became a strongly established commodity around 500 B.C. Making glass in these early days was difficult and expensive, as glass blowing and pressing had not been discovered yet, clay vessels used for melting the glass were not of good quality, and it was difficult to generate sufficient heat to facilitate melting. Eventually, glass makers learned to make colored glass and began to create glass jewelry, and tiny vessels, which were considered as precious as fine jewels! The blowpipe was invented around 30 B.C. This phenomenal invention was a revolutionary event in the history of glass making. The tools and techniques used to form molten glass have changed very little over the centuries. The craft of glassblowing was passed from father to son, and from master to apprentice. From its beginnings, the formulas and procedures used in glass making were closely guarded. At times in history, the penalty for disclosing secret techniques was death! Glassblowing is done in the same way today, as it was in medieval times with the same type of tools. Glassblowing is an art that takes years and years to master. In the old days an apprenticeship was 15 years. The glassblower has to spend all his working life practicing his techniques. A glassblower will never be “fully trained”. A glass furnace has to be built especially to suit each glass studio’s specific needs. We have one pot furnaces. This means the molten glass sits in a ceramic pot inside these furnaces. These are very specialized ceramic pots, built by hand in Germany. They are shipped to Australia in the “raw" state, meaning that they are not fired until we have placed them inside the furnace. Each pot holds 250 kg of molten glass, and is used for 12 months before it is changed for a new pot. Changing the pots this often, enables our studio to have the best quality glass possible. Each time we change the pot, we have to turn off the furnace for approx 4 weeks, to enable the furnace to first cool down enough to be handled. The front of the furnace has to be taken off brick by brick for us to reach the old pot, remove it and replace it with a new one. The glass furnace then has to be heated up VERY SLOWLY over a period of approximately 14 days. We increase the temperature approximately 100 degrees Celsius (212 degrees Fahrenheit) per day, and after 14 days the furnace is up to a temperature of +1420 degrees Celsius (+2620 degrees Fahrenheit) and the pot is ready to be fired. After the firing of the pot, it has to be glazed. This is done with molten glass from the other furnace. After the firing and glazing, the temperature is taken down to +1360 degrees Celsius (+2512 degrees Fahrenheit) and the first batch of glass can be melted. The furnaces continue to burn day and night. It takes just as long to take the furnace down in temperature as it takes to get it up. That is why we never turn a glass furnace off except for the pot changes. The working temperature of the glass in the furnace is + 1150 degrees Celsius (+2134 degrees Fahrenheit). The glass at that temperature has a texture of runny honey and the glassblower has to roll the pipe at all times or the glass will fall off the pipe. The glass needs to be soft and pliable to enable the glassblower to shape and blow it into its final shape. The temperature of the glass while being worked on the blowpipe is approx. +700-1000 degrees Celsius (+1292-1832 degrees Fahrenheit). Wet Newspaper: For shaping. A layer of steam builds up between the surface of the wet paper and the hot glass, which allows the glassblower to hand-shape the glass without getting burned. Wet Wooden Block: For shaping the very hot gather of glowing glass into a symmetrical form. These are usually made from cherry wood or other fruit wood (which burns slowly and holds water well). Jacks: The glassblower's most essential tool. The design has not changed in the past 2000 years. Jacks are used to "cut" the hot glass and to shape and sculpture. Shears: To cut and trim hot glass. Glory Hole: A gas fired drum-shaped chamber used for heating and re-heating glass, which is on a glassblowing pipe or a punty rod. The glory hole is kept running only during work hours and is turned off during the night. Glass is reheated in the glory hole to keep it at the right working temperature. Gold Coast Lighting Store. Annealing Kiln: An electric, insulated kiln where the finished glass objects are placed upon completion of the hot process. The temperature in the annealing kiln is +500 degrees Celsius (+932 degrees Fahrenheit) which is the same temperature as the finished piece. Any hotter, and the piece will collapse and lose shape. Any cooler, and the piece will crack. At the end of the day it is gradually taken down to room temperature over 48 hours, to relieve thermal strain and stress within the glass.